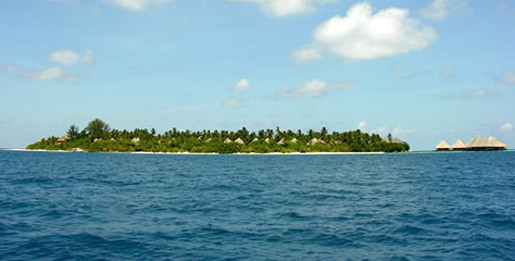 Adaaran Club Rannalhi is locates in South Malé (Kaafu) Atoll, 34km. from Malé International Airport. Five hectares of nature’s unparalleled beauty combine to offer an exquisite tropical island getaway for just about everyone. Club Rannalhi’s water bungalows are a luxurious experience in themselves – a private sun deck and glass floor for reefwatchers are just two reasons why communing with nature gains a whole new meaning here. A great place to relax and recharge your batteries after a hard day’s play. Rannalhi’ two storied chalets offer comfort and space in your private living area, with full facilities. The large, airy restaurant is more than just a place to eat – it’s also a place to meet and make friends with your fellow guests. Frequent theme nights let you sample the cuisine and culture of the world. Snack menus and a variety of hot and cold beverages form part of your all-inclusive package. Drop by whenever you feel like it! A choice of places to sit, sip, meet and exchange fun and laughter. Watch the play of wind and water around our award-winning Dhoni bar, or enjoy the more private ambience of the Bungalow Bar. A rich choice of clothing, souvenirs, accessories and those little essentials you can’t do without. A trove of fine Sri Lankan gemstones and a selection of fine jewellery. Like the pirates of old, you may find treasure on a tropical island! Every day passes in a blur of activity when you go out to play in the company of our friendly, highly-trained animators. Activities include Water Aerobics, Beach games & a resident DJ. In bed, or out on the terrace of your bungalow. For those very special mornings. Dine by lamplight on a snowy beach as the afterglow paints the sky with purple and indigo. Raise your glass in an intimate toast to the rising lovers’ moon. An experience not to be missed. The refreshing, rejuvenating powers of a traditional Ayurvedic massage will amaze you. Just the thing for those mornings when you’re feeling a little slow off the mark. A full-day excursion that includes a visit to an uninhabited island – ideal for swimming or relaxing under the sun after (or even before) a delicious barbeque lunch. A visit to an inhabited island offers a taste of Maldivian life and culture, the perfect end to a perfect day. The most popular excursion in Maldives, this gives you an opportunity to enjoy the spectacular sunset while dropping a hand line near a reef or an ideal fishing spot where grouper, snapper, squirrelfish, skipjack and barracuda abound. Bait fish, weight, lines and hooks are all provided, along with a friendly boat crew. Your catch of the night can be served (on request) at dinner the following day (limit: two fish per person). The Village Tour – a glimpse of the life and heritage of a community of around a thousand people living on one of Maldives’ magical islands. A place to acquire souvenirs and local handicrafts, plus a lasting memory of exotic Maldives. Wake up early to experience the ocean and coral reefs at their best, surrounded by palms and sandy beaches, while you try your hand at trawl fishing the Maldivian way. A morning in Malé, traveling on foot – the most interesting and enlightening way to experience the hive of activity that is the Maldivian capital. The magnificent marble and gold Grand Mosque, the heart of the Sunni Muslim community, is a must-see. The Rannalhi Dive Shop & Diving School has everything you need for diving and snorkeling adventures. Plus, our Water Sports Centre offers you the chance to enjoy catamaran, canoe and banana-boat rides, windsurfing and water skiing. There’s really no limit to the water sports you can enjoy at Rannalhi. For the avid diver, we offer boat diving and house-reef diving courses leading to PADI certification in English, French, German, Italian and Russian.